Commonly called the Golden Everlasting, Xerochrysum bracteatum is one of the most widely grown native flowers. With papery flowers that last well when dried, this perennial is a favourite with gardeners and florists alike. It does vary greatly in form from low growing types to taller plants. The flowers are large and colourful, and with new hybrids available, flower colour is now varied. And just to confuse things a little more, both annual and perennial forms are also available. These are one of the first Australian plants to be propagated in Europe, and a number of cultivars have been developed outside of Australia. In Europe these are known as ‘straw flowers’ in Australia, ‘Everlasting, or Paper Daisies’ . Flowering time is from spring right through until winter and this long flowering nature makes them a valuable landscaping plant. These are useful plants for attracting butterfly’s and bees and also makes a good dried flower as well, fairly easy to grow in a well drained soil. Reasonably drought tolerant and disease resistant, a great Australian plant that is also widely used for cut flowers. The flowers are dried and a are very long lasting. X. bracteatum ‘Dargan Hill Monarch’, good yellow flowers with a golden centre on a bush that will reach around 1m in height. Way back in 2011 this plant was featured in the Chelsea Garden Show. X. bracteatum ‘Diamond Head’ is a low growing variety. A well drained soil is essential, and some extra water during long dry summers is also beneficial. An annual application of a slow release native plant fertiliser will improve growth and flower production. Plants are best replaced after 4-5 years. Regular pruning seems to improve flowering, it also improves longevity of the plant. Start by removing spent flower heads, it will not only prolong the life of the bush but also encourage a more bushy habit with more flowers. So only a light tidy up after flowers to keep the clumps a little more compact and remove some of the older foliage will be required. Heavy pruning is not recommend as die back often occurs. 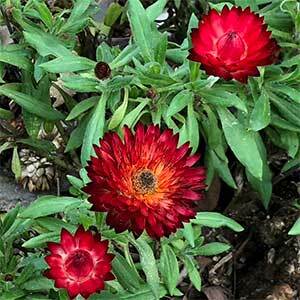 Two forms are available, those grown an annuals and those grown as perennials. 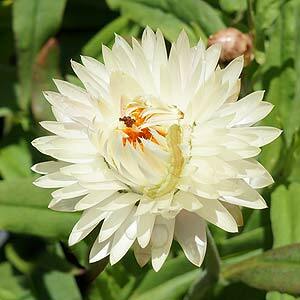 The annuals are grown from seed, the perennials from cuttings or seed. Propagation of plants is fairly easy from seeds or cuttings, but remember that cultivars will not come true from seed. 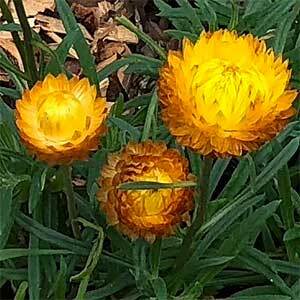 Common Name – Strawflower, Golden Everlasting, Paper Daisy. Flowers – Yellow to Pink and Red.